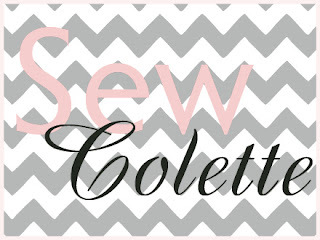 It's my favorite part of Sew Colette, parade day! I just LOVE looking at the Flickr Group and seeing what you have all been making and how different everything looks with the various fabrics and modifications. Ok, ok, let's look at the pretty dresses! I loved Karen's Meringue skirt and I love her Truffle dress! She omitted the ruffle and added a bow to the front. The fit is spot on too. Sarah's added details are perfect for her dress! The pearl at the top is so dainty and her zipper is perfect. Do you have any tips on doing a zipper like this, Sarah? I'm in awe! Liz did such a good job on her dress! 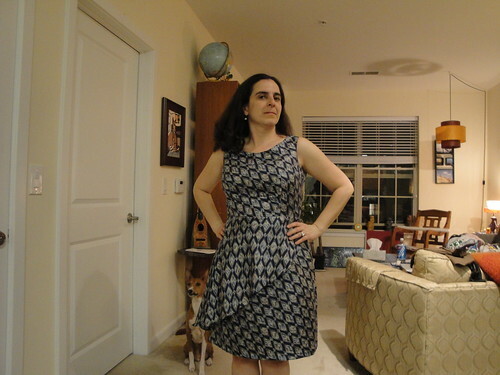 The ruffle shows up very nicely (I'm jealous) and the dog in the background is awesome. Liz, my dog Frankie likes to be in front of the camera too. What's not to love about my BFF Rochelle's dress? The piping, the belt (I am dying to learn how she did it), and the fabric are so perfect together. There were other dresses that I wanted to post, but I can't hog all of you before Sarah gets her post up! ;) Thank you for sewing along with us!!! I love Karen's polka dot version but Rochelle's vintage inspired dress tops it off! Kudos to Rochelle! Aaagh, I just finished my Truffle-- now I can slow down and oggle everyone else's! I LOVE Karen's fabric, and man, the fit is perfect. I think Rochelle is winning at making each of these patterns her own, though: her versions are always so unique! I am having such a hard time picking my favourite Truffles! Karen's Truffle is so chic and classic! Definitely envious. I love the way Liz's truffle ruffle (hehe) is accentuated by the different direction of print! It makes for great visual interest. And yeah I'd love to learn how to do a little hidden zipper like Sarah! Thanks so much for featuring me! I'm really enjoying the sew-along and it's so inspirational to see everyone's different takes on the same pattern. Aren't we lucky to be part of such a great sewing community? Ooh, I love all the directionality of Liz's dress!